Product prices and availability are accurate as of 2019-04-12 02:05:39 EDT and are subject to change. Any price and availability information displayed on http://www.amazon.com/ at the time of purchase will apply to the purchase of this product. 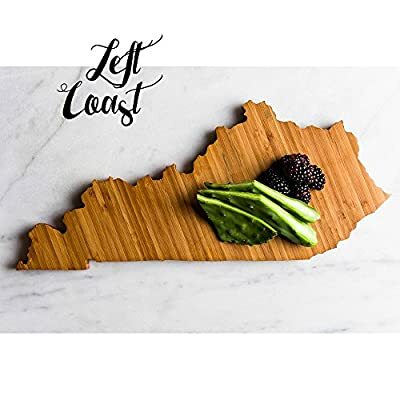 Kentucky State Cutting Board Our custom crafted Kentucky Home State Cutting Board is the perfect gift for weddings, holidays, anniversaries, graduations, or closing gifts for realtors. Show your state pride by serving your guests with an Kentucky Personalized Cutting Board! Our cutting boards ship in 1-2 business days! Each Home State Cutting Board is meticulously designed, expertly crafted, and lovingly finished by hand in our little workshop in Largo, Florida. We cut no corners and pride ourselves on excellence in every piece we produce. There are a number of outlets selling state cutting boards online. But make no mistake, our Home State Cutting Boards are locally crafted from the finest bamboo stock and made into the highest quality cutting boards you can buy. From the incredibly precise cuts to the silky smooth finish, everything about our boards feels luxurious. This Kentucky Cutting Board measures approx. 18in long, 12in wide, and ¾ inch thick. Each board is finished in our food safe beeswax and mineral oil Homemade Board Butter. You can buy an extra tin here https://www.amazon.com/dp/B01LZ7YNV4 Our cutting boards are made with bamboo, an all natural material, so please be aware that there will be natural variations from one board to the next. **Ordering** If you'd like initials engraved on your board tell us which initials you'd like in the personalization field provided when checking out. Also tell us which city or town you'd like the initials engraved over. Heart, House, or Square initials engravings are about ¾ inch by ¾ inch. Wholesale pricing is available! We are proud to produce custom pieces for some of the nation's top realtors, wineries, marketing firms and others. Drop me a note including the piece you're interested in and the number you'd like to order, and I'll be happy to get you a price and shipping info promptly.